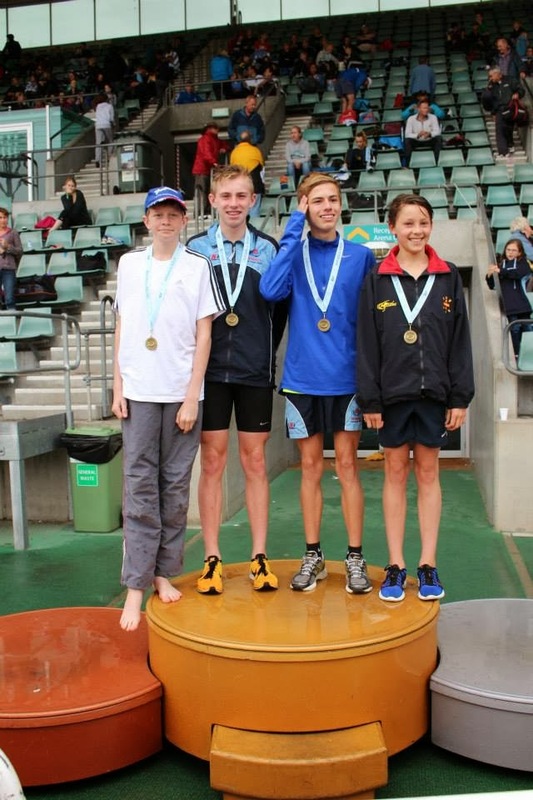 This proved to be a very exciting weekend of racing and we had for the first time a NSW Track Relay Champion, thanks to the Under 16 boys in the 1500m relay. We put in a whopping 12 teams - 4 girls' teams and 8 boys teams. 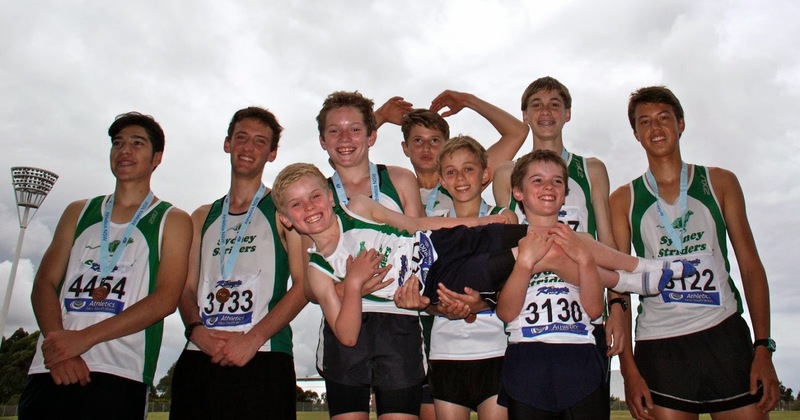 The age groups start at under 14, so a lot of our 9, 10, 11 and 12 year olds were racing much older athletes. Overall we came away with 1 gold (under 16 boys 1500m), 2 silvers (under 14 boys A 800m and u14 girls 1500m) and 2 bronze medals (under 18 boys 1500m and under 14 boys A 1500m). So, overall, it does look like as a club we are best at the 1500m. 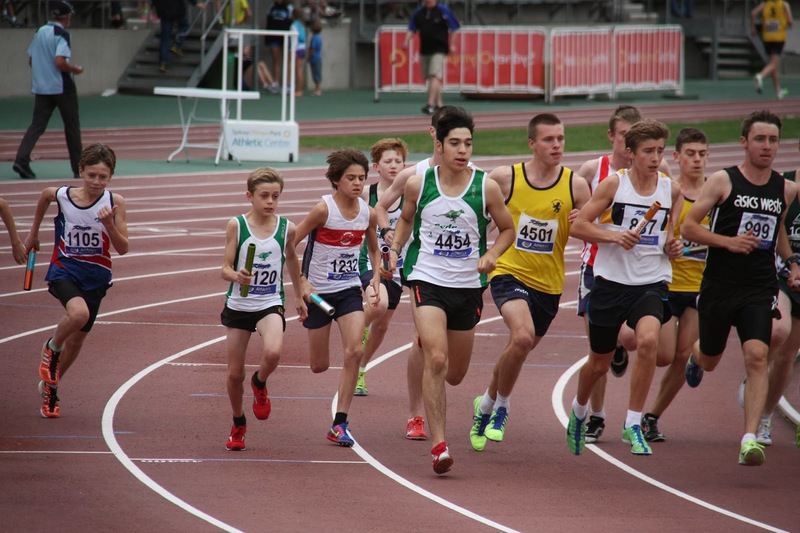 There was even a dads team in the 200+ 1500m on Sunday - Michael Halmy,Tony Wong, David Jagger and John Law. You can see how wet it was on Sunday in the pictures below. More on that gold medal winning group. 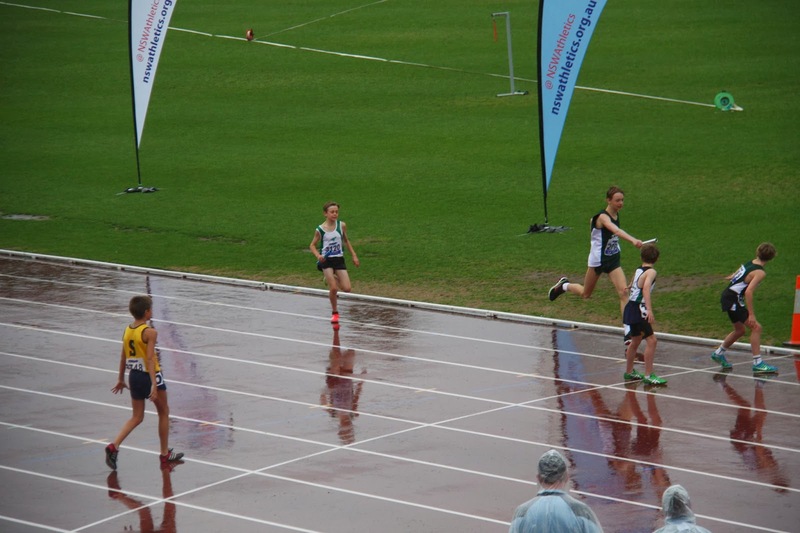 It was a very wet Sunday afternoon, Josh Phillips set off in the teeming rain in the first leg of the Under 16 Boys 4x1500 and came home first in 4.14. Fraser Mckinley and Ben Jagger kept us in touch on the second and third legs. 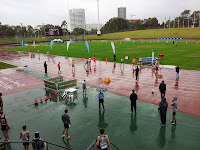 Lachlan Cooper made up 60m on the last leg and regained the lead with just over 200m to go to claim gold. On Saturday Josh, Fraser, Lachlan and Harlan Mulherin won bronze in the under16 boys 800m. 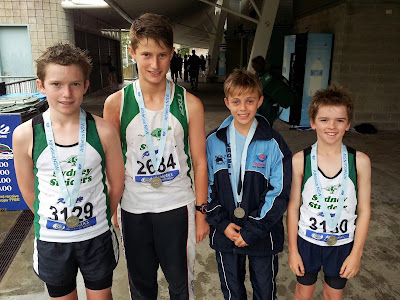 The Under 14 boys’ team of Liam Gorman, Will Law, Tom Davies and Kieran Gorman won a gallant silver in the 800m to go with their bronze in the 1500m. The two B teams did very well too and got some good practice. The Under 18 boys had a mixed weekend. 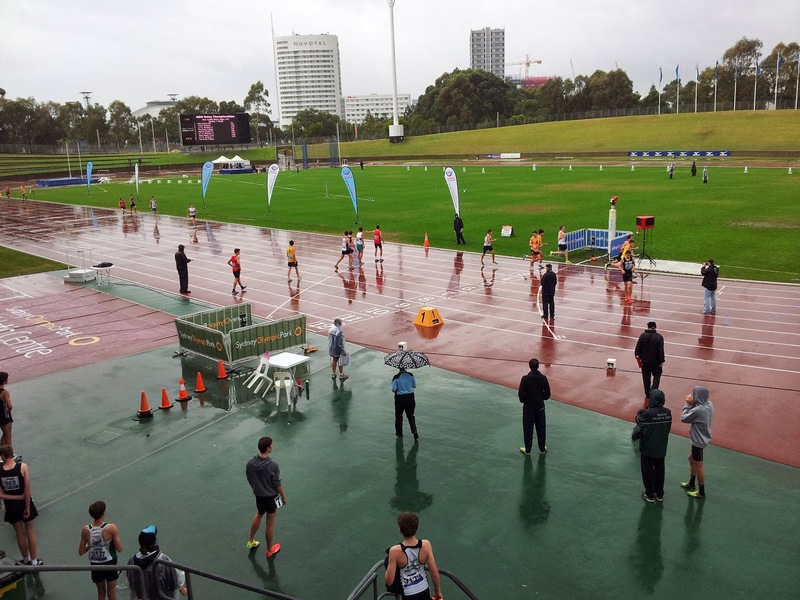 The team of Daniel Francken, Gus Wong, Adam Halmy and David Gardiner won bronze yesterday in the 1500m. Daniel’s 4.11 was the fastest time over 1500 this weekend. 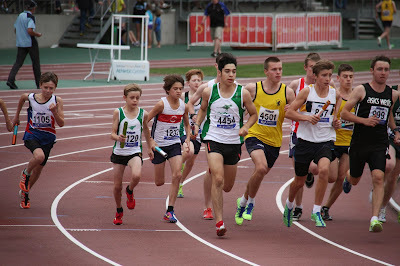 On Sunday the team of Gabe Corke, David Gardiner, Gus Wong and Adam Halmy finished 7th in a very competitive 800m relay. Under 18s and Under 14s together. Daniel Francken, David Gardiner, Liam Gorman, Will Law, Adam Halmy, Gus Wong, Cam Gorman being carried and Tom Davies and Kieran Gorman helping carry Cam. The 1500m start - Tom Davies, Tom Kirkland and Daniel Francken all on first leg. Under 14 boys with their silver medals for the 800m: Liam Gorman, Will Law, Tom Davies and Kieran Gorman. The Under 14 girls team of Olivia Hogg, Ciara Sinclair, Emily and Sophie Gocher won silver today in the 4x1500 relay. Sophie made up the length of the straight in the last leg from 3rd to 2nd. Her time of 5.05 was the fastest time for a girl Strider over the weekend. On Saturday the team of Sophie, Emma Kirkland, Nicola and Olivia Hogg came in a very good 7th out of 12 in the 800m relay. We also had an under 14 girls 200m team with Sophie Wickham, Amy Polikowski, Emma O'Reilly and Nicola Hogg, which did well. Our under 16 girls 400m team with Tessa Constantine, Emma O'Reilly, Amy Polikowski and Sophie Wickham put up a good fight against girls much older than them. 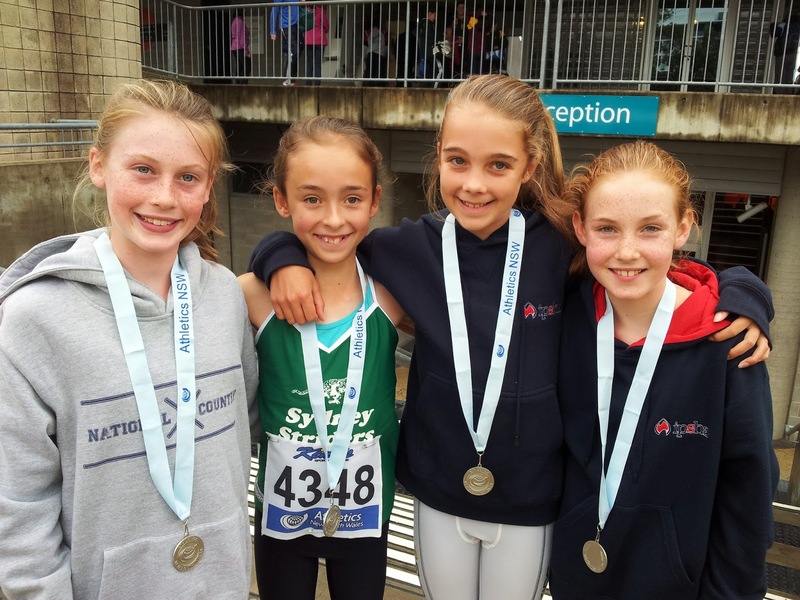 Sophie Gocher, Ciara Sinclair, Olivia Hogg and Emily Gocher - silver medal winners in the under 14 girls 1500m. 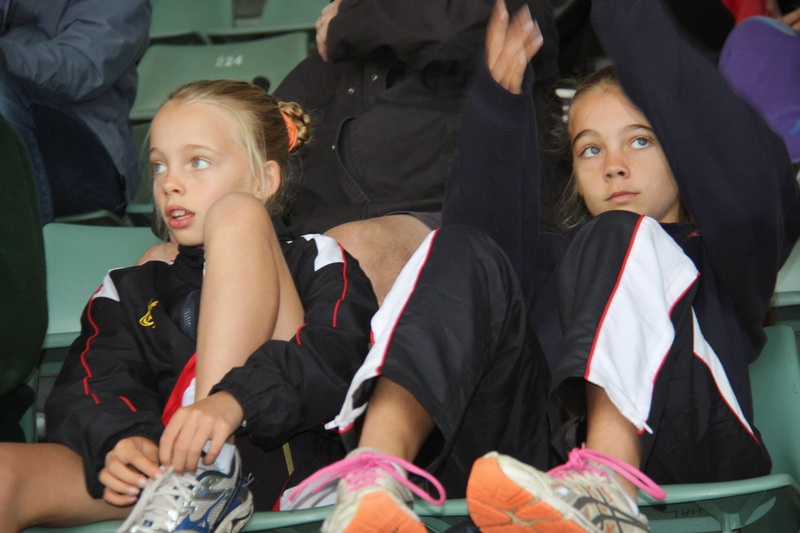 Tessa Constantine, the only girl who actually was a true under 16 girl in the 400m relay. A scene from the stands on a rainy Sunday - the Hoggs.